Crystals have been around for millions of years. Crystals and crystalline rock make up almost all of the earth's crust and the human body is crystalline in nature. Crystals can absorb and transmit a multitude of different energies. Crystals exist in a variety of colours and shapes, all of which are very beautiful. The human body consists of crystalline structures. We are almost entirely made of water which is a form of liquid crystal. Our blood is also a liquid crystal and the trace minerals in the body are crystalline in structure. Other systems in the body are formed of crystalline substances (e.g. the pituitary gland). Crystals can therefore be used to affect our bodies at an energetic level. They are ideal for clearing negative energies within our bodies and our energy fields. They can be used to clear energy blockages and change our resonance, making our bodies vibrate at higher frequencies. Since the beginning of time, crystals have been used by various different civilisations around the world for healing, meditation and special ceremonies. Crystals have many uses, including energising a room, absorbing harmful emissions from electrical equipment, meditation and healing. In modern times, man has made great leaps in technology thanks to crystals - from the first lasers to liquid crystals in displays. They are now used in communications, information storage, solar power and laser applications in industry and medicine. Not forgetting that we all wear a crystal on our wrists every day - our watches contain a crystal slice! When choosing a crystal it is always best to use your intuition. Look at the colour, shape, size etc. of the crystals available and you will normally feel more drawn to one of them. Go with this flow. If you do not feel any such attraction, then you can try holding different crystals to see how they feel (use your left hand as this is the receiving hand and is generally more sensitive). You could ask someone to call out the names of different crystals - you might like the sound of one of them better than the others! Alternatively, you could think about why you want the crystal and look at the appropriate descriptions to get an idea of which one might help you. Remember, that everybody is different. Each crystal will have a different affect on different individuals. The crystal's energy will always go to the area of the body (or mind) that needs it the most. Therefore, use any descriptions of crystals as a guide only. The following table shows a list of crystals and their keywords. The keyword sums up the main properties of each crystal. It's like the main 'theme' of the crystal, generally it will work on this area of most people - you might be an exception to that rule! Amber Warm, soothing like liquid gold. Sacral/Solar Plexus. Amethyst Balancing, helps with change. Spiritual. Brow or heart (with rose quartz). Carnelian Physical energy. Sacral/Solar Plexus. Chrysocolla Expansion of awareness, knowledge. Thymus. Citrine Happiness, communication. Solar Plexus. Clear Quartz Cleansing, energising, balancing. Crown. Cuprite in Opal Ancient cosmic connection. N/A. 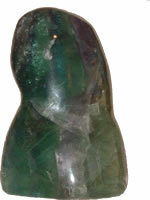 Emerald Grounding, deep cleansing. Heart with rhodochrosite. Garnet Nourishing, warming, strengthening. Sacral. Green Calcite Refreshing, revitalising. Lungs. Hematite Grounding and protecting. Base or between feet. Larimar Good 'all-rounder' Helps with painful bones/muscles. Malachite Physical balance, draws out pain. N/A. Moonstone Emotional healer, feminine, gentle. Solar Plexus. Obsidian Grounding. Base or between feet. Orange Calcite Happy, joyful energy. Sacral/Solar Plexus. Rhodochrosite Heart healer, deep release. Heart. Rose Opal Relationship healer. Heart. Rose Quartz Love, soothing, heart healer. Heart. Ruby in Zoisite Hormone stimulator. N/A. Selenite Cleansing, brings in light. Ultimate light cleanser. Crown. Sodalite Personal protector. Cleansing. Throat/Thymus.